About five years ago, the British media sent itself into a frenzy when it was announced that Cockney – a derided but traditional London dialect – was entering its final days, to be replaced by Multicultural London English (MLE). Today, MLE is the sound of the city’s youth, a vocal mix of the capital’s past and diverse present. It’s not just slipping in some slang, but the effortless and subconscious meshing of West Indian, African, and South Asian sounds to make a hybrid, homegrown voice. Predictably, the music coming out of the city has begun to tell the same story. Over the past year, the British charts have become dominated by songs with a West African and Caribbean flavour. It’s not quite the Afrobeats sound rising from West Africa and going global, nor is it bashment, even if it owes some of its melodies and rhythms to sounds hailing from Jamaica. Some have called it afrobashment, afrowave, or afroswing. Much like the early days of grime, when Wiley rapped “Wot Do U Call it?”, there isn’t yet a moniker that has stuck – but the scene is catching and evolving. Whatever it is, its popularity means it’s no longer uncommon to hear songs interspersed with pidgin English on mainstream radio, or to hear acts like Stefflon Don codeswitch to patois in their hits. 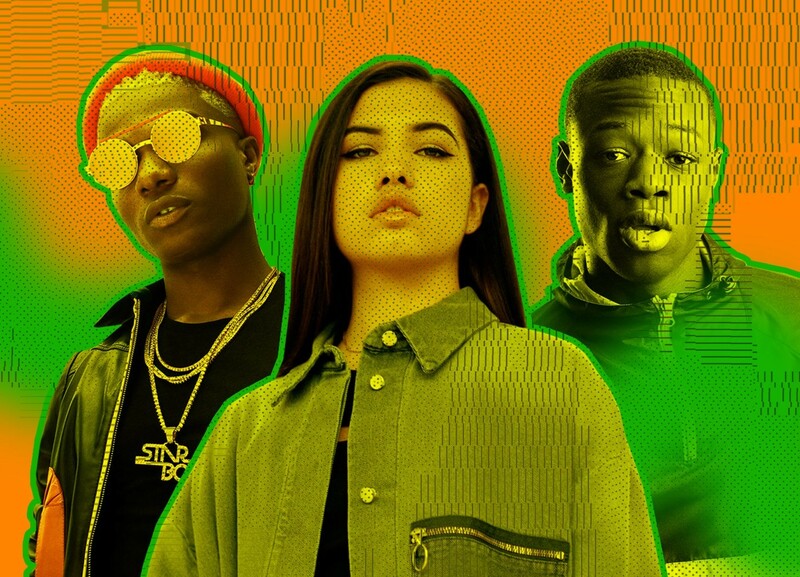 Since the likes of J Hus, Not3s, and their peers burst onto the scene, the Top 40 has seen iterations of their style ever since, from underground acts and mainstream pop stars. In the last year, Ramz has had the most successful debut single with “Barking”, peaking at number two. According to the official charts, it sold just shy of 520,000 copies, making it the fourth biggest song of the year. Right now, “German” by (adj) EO is at number 15. J Hus’s “Did You See” was the 15th most streamed song of 2017, getting to number nine in the charts, while Stefflon Don has notched up over 20 million on-demand streams in the US. All of the above call on the emerging sound to prop up their popularity. Martin Connor is a specialist in rap analysis and vocal melodies, having worked with Vox on a series of impressive videos that break down styles like the “triplet flow” in American trap rap. He listened to a selection of the UK’s biggest artist right now – singers like Raye and Mabel, rappers like Stefflon Don and J Hus, and beyond – and compared them to their peers across the globe. “While the songs are technically in 4/4, what you will hear over and over again is this recurring pattern made up of three notes that are still repeated in the framework of a 4/4 time signature,” he explains. “You can hear the inspirations of Jamaican music in the rhythm except Jamaican music doesn’t have a bass kick and the snare – that’s hip hop, that’s traditional rap. So this is that translation of cultures happening subtly in the instrumentation. Yet it still has a hip hop sensibility in terms of lyrical focus and music videos: cars, money, authenticity, hardness.” This, paired with African melodies and percussion, gives you that blended scene. Considering some of Britain’s oldest black communities are West Indian and have been settled here since the Windrush era, playing with Caribbean sounds isn’t particularly new. There’s also been a lot of criticism from the persistent borrowing of Carribbean sounds without credit to those who really pushed the scene forward on the ground. What is new is an overtly West African presence in the British charts – a few years back you’d be hard pressed to find pidgin English in a pop record. This is undoubtedly linked to the increased presence of black British Africans in Britain’s cities generally. In London, for example, the number of people identifying as this demographic jumped by over 50 per cent between 2001 and the last national census in 2011. As the fastest growing black community in the cultural hub of the UK, of course they’re making their voices heard. In April, I saw firsthand the near constant networking between the new generation of UK artists and Afrobeats heavyweights who’ve sensed the movement happening. To strengthen the collective reach on either sides of the pond, Boy Better Know curated the Homecoming festival in Lagos. Then, while stuck in traffic during the city’s rush hour, Mabel’s manager, Radha Medar, spoke to us about the scene from behind the scenes. For her, the trick to having staying power for emerging talent and genres is to be backed by a community of people, and right now, this is what young people want to listen to. “With Mabel, ‘Finders Keepers’ existed before I started working with her – but no one had clocked what a big hit it would be,” she says. “When I heard it, I instantly thought that it fit in with what is happening right now.” As the youngest daughter of riotous pop icon Neneh Cherry and Massive Attack producer Cameron McVey, the singer already represented a rich mix of cultures. Medar is sharp, and has the assured conviction that can only come from being deeply embedded in the scene she’s now steering. She can count the managers of the biggest stars in UK rap as her friends – she’s known Skepta’s manager, Grace Ladoja, since her clubbing days. 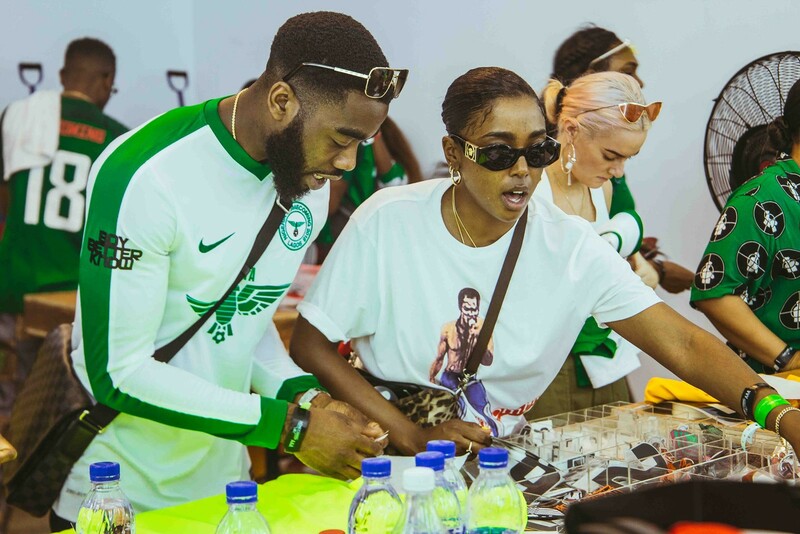 Mabel’s frequent collaborations with Not3s have been hugely successful, and here Medar drinks and laughs with Fola Adeyemi, who represents the rapper while on vacation. It appears that a lot of the managers in this growing scene are young, black, and know their acts or peers through years of friendship, making each decision more organic and fresh. Looking at the commercial success for acts blending global genres like Justin Bieber’s “Sorry”, and Ed Sheeran’s “Shape of You” there’s obviously more staying power for pop songs with a more tropical sound. The collaborations on Drake’s More Life had an instant impact in the global presence of grime, and on-the-rise acts like Jorja Smith and this new set of artists has their sights set on similar tactics. As such, Mr Eazi has jumped on to tracks with pop songstress Raye, while British-Jamaican Stefflon Don sings “I got jollof and suya for you,” on the latest Davido track, and Yxng Bane’s new song “Vroom” features dancehall legend Beenie Man. All of whom have realised the sound will travel further as a team. Breakout stars in UK hip hop are crossing the boundaries and experimenting with genres beyond traditional rap or grime. While pop is having an identity crisis, here a group of black Brits assured of their heritage as much as their Britishness are reaching far and wide within the diaspora to create a united sound. In 2018, UK pop is a melting pot.